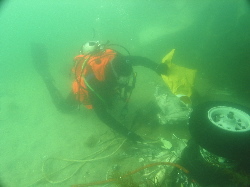 Finding lost or buried items underwater can be frustrating if you don’t know how. Finding drowning victims can be a different kind of scarey. I mean it seems so easy. Just dive down where you lost the item or the person was last seen and it or they should be right there – right? Wrong. Dark water, silt, water temps close to freezing, gear problems and much more can lead to frustration and great danger for the rescuer. While no one wants to get hurt, diving search and recovery requires special training, skill development and constant practice to stay sharp. Will you be ready? Or will you be mentally psyched out by the concept of recovering a drowning victim. 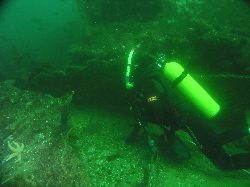 Hundreds of dives need to be performed, bodies and property are waiting to be recovered. The public is looking at you to do the job – can you? You can if you take the time to get trained. Now is that time. The ocean is a complicated thing and learning to locate and then recover items is a serious activity that can pay big money. Your instructor for the workshop is PADI Master Instructor, Donald Ferris. Don is the authoratative voice in Cape Cod diving having authored three books on diving including, Beneath the Waters of Cape Cod, Beneath the Waters of Massachusetts Bay, and Exploring the Waters of Cape Cod and the Anthology of Cape Cod Shipwrecks. He has performed dive training for the Hyannis, Yarmouth, Centerville/Osterville, Barnstable Natural Resources, Martha’s Vineyard, Harwich, Orleans and Chatham fire departments. This class is almost all water orientated with the emphasis on diving as many different dive conditions as we can in a relatively short period of time. The overall concept is to develop the proper skills necessary to enable you to dive anywhere on Cape Cod, in any type of visibility, with safety, skill, and confidence. And man, I gotta tell you this instructor is entertaining as well as challenging. Don has certified over 1000 people to dive on Cape Cod with more than half of these certifications at the Advanced or Specialty level. He grew up on the Mississippi river and learned to dive black water in it’s murky depths. He really knows how to teach diving. You’ll get hands on experience with search lines, search patterns, lift bags, and air lift devices and more. On the first day you’ll be learning search and recovery diving knowledge that you will utilize your entire diving career. Don will demonstrate how to minimize the dangers associated with search and recovery diving and discuss practical problem solving and previsualization as a group. We’ll do some pool training to learn new skills and don’t worry about a written test, there isn’t one. We want you learning, not memorizing. Next we’ll head out to a local dive site for some real life practice. 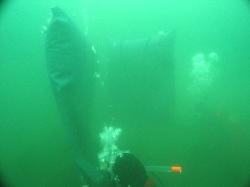 You and your fellow firefighters will be actually setting up the dive plan and securing the site for diving. Once underwater you’ll be practicing new skills like search patterns that really work (even in zero visibility) air and problem management, entanglement, hazardous marine life, and lots more. The next time we meet, we’ll explore new ground and polish up our skills and improve our speed of recovery. And we’ll keep diving until you master the skills needed. By the time the workshop is through, you’ll have four to eight search and recovery dives under your belt and lots of new experiences. You’ll be ready to dive when duty calls. 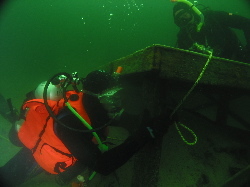 Certification in Search and Recovery Diving from P.A.D.I. Prerequisites: Advanced diver certification. Note* The course instructor reserves the right to require remedial training if you have not been diving on a regular basis since your certification. You may also wish to check out our Deep Diving, Drift Diving, Night Diving, Dry Suit Diving, Underwater Metal Detecting courses listed in this web site. Specialized Equipment: Full scuba equipment including a recently serviced regulator, octopus, full instrumentation , full wet, two dive tanks 80 cu. ft. or larger, one large light, and wreck reel. Note* all smaller lights must be able to be “clipped” to your dive system.